Six members of Orbit Trampoline Club competed in the second National Trampoline League event in Cardiff last weekend. Charlie Roberts, jumping in the 13-14 category, came in a fine second place with an excellent performance, picking up 75 points. Orbit had three girls competing in the 13-14s. Millie Heathcote came home in 10th place, while Milly Cole was 12th. The star performer though was Rebecca Dormer, reaching the final and coming sixth overall. 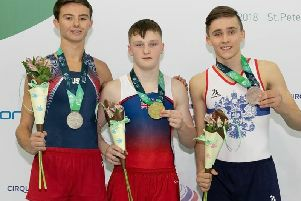 Moving up to 19+ Men’s, Ritchie Clarke completed both routines, an improvement from April, and a seventh place finish gained him points and a place in the final. However, at this point Ritchie found springs in his heels, registering the highest ‘time of flight’ with the maximum tariff, and narrowly stole the gold from under noses of his rivals. Finally, in the 19+ Ladies, Tess Walker completed a positive entry for the club, finishing both her routines in style, also gaining herself points with ninth place.